The glacier is not only massive, but also one of the least stable of the West Antarctic Ice Sheet ice flows. In the past 40 years, its melting rate has accelerated due to relatively warm ocean currents that have seeped underneath its base and lubricated its flow seaward. As it slips into the ocean, the glacier's ice shelf — the part that floats on water and extends beyond the glacier's base — disintegrates through a natural process called calving, exposing yet more of the glacier to warm waters. Last year, an iceberg larger than the city of Chicago broke off into the surrounding Amundsen Sea. Many researchers have tried to predict the future behavior of this important glacier using mathematical models but, given the complicated nature of glacial dynamics, all of these attempts have been limited and prone to error. Precipitation, wind patterns, atmospheric temperatures, oceanic currents and the shape of bedrock underneath the glacier are only some of the numerous factors that control glacial growth and retreat. Models predicting glacial behavior are therefore very complicated and always prone to some degree of error. Researchers based at the French National Center for Scientific Research in Grenoble have now developed state-of-the-art models that, while still limited, provide the best estimates yet of the future behavior of Pine Island Glacier, they say. The team has found that the glacier's grounding line — the point where glacier and its ice shelf meet — is about to retreat over an oceanic trench that would increase the amount of water that seeps underneath and melts the glacier. Their models suggest that this would cause the glacier to uncontrollably retreat about 25 miles (40 kilometers) over the next several decades, potentially raising global sea levels by more than 0.4 inches (1 centimeter). Retreat may slow once the glacier passes the trench, the researchers report, but it will not likely regain stability or enter a positive-growth phase. "Whatever it will do, we are already engaged in a big change," study co-author Gael Durand told LiveScience. "We have passed the tipping point." Eric Steig, a glacial geologist at the University of Washington who also studies Pine Island Glacier but was not involved in this study, thinks the study provides the best models yet of this particular glacier's dynamics. Still, he points out that the models make the assumption that melting rates will increase in the near future and that, while this is likely, it is not necessarily a given. Last month, Steig and colleagues published a paper in the journal Science reporting that Pine Island Glacier's retreat slowed significantly in 2012 due to oceanographic changes related to La Niña. 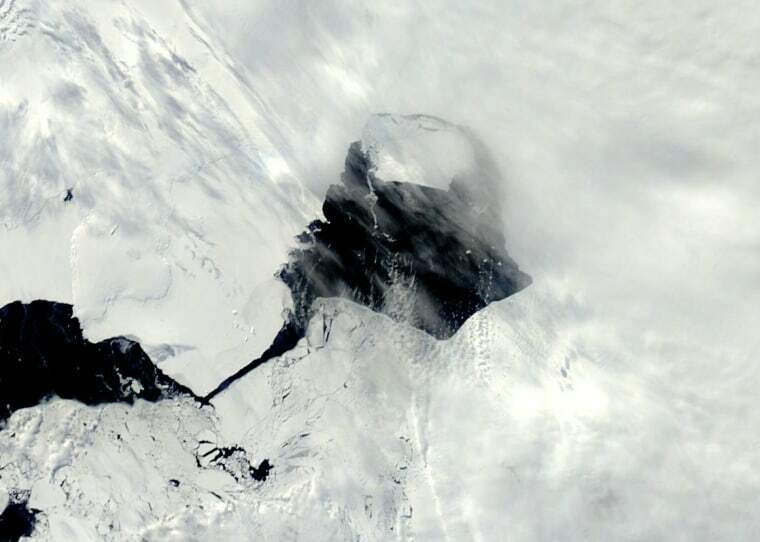 While this seems to have been an anomalous event, Steig says that the 40 years of data gathered on the glacier may not be enough to make accurate predictions about its future behavior, and about what is normal or anomalous for its flow. "I actually think it's a good assumption that the melt rate will stay high," Steig told LiveScience. "But my confidence that that is right is extremely low and the reason that it is low is that it depends strongly on what happens elsewhere." For example, La Niña — a weather pattern related to El Niño that brings cold-water masses up the coast of South America, into the central equatorial Pacific, and eventually along the coast of Antarctica — originates as far away as the equatorial tropics, and has a significant impact on the behavior of the glacier. Future work will need to take these distant global factors into account in predicting the behavior of the glacier. Still, despite these shortcomings, Durand is convinced the glacier has little chance of regaining stability. "We showed that it will need a very large decrease of the melting condition below the ice shelf and that the oceanographic conditions would need to be much colder than it was before it started its retreat [to maintain stability]," Durand said. "What will come next is an open question, but to recover to its 1990s position is unlikely." The study findings were detailed earlier this month in the journal Nature Climate Change. Follow Laura Poppick on Twitter. Follow @livescience on Facebook &Google+. Original article on LiveScience .